This vegetarian stew was completely winged tonight but I ran with the concept of trying to heighten each flavor first, and then bring things together. I loved how it came out. The idea of the turnip puree came from Kevin on Top Chef last season and I loved it — was almost like coconut milk. 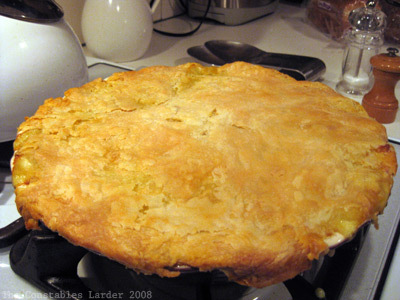 It reminded another person of a chicken pot pie. 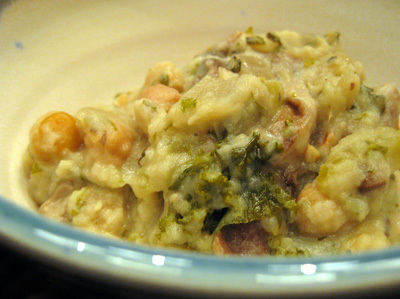 I loved how the puree thickened the meal into a great comfort dish without the need for flour. This was a big hit so I thought I should write down my best memory of the process while it was fresh in my mind. The amounts below are kind of rough, but it’s stew — nothing needs to be exact here! A. In a large pot, saute the onions and garlic in a touch of olive oil and 1 tbsp of butter, and let slowly cook on low heat for 15 minutes. Add the celery and a couple pinches of salt and continue to cook. 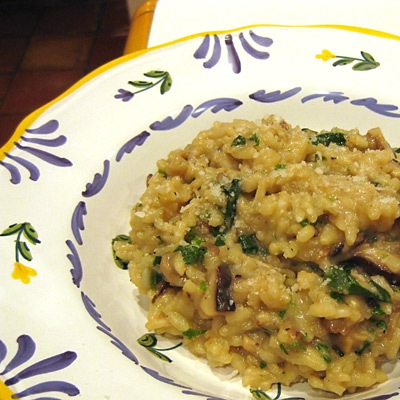 C. Melt 2 tbsp of butter in a saute pan and cook the mushrooms, with a couple pinches of salt, for 15-20 minutes. Add 1 tbsp of apple cider vinegar near the end. Pour 1/2 cup of vermouth (or white wine) into the pot with the onions and celery and let it cook down a bit, then add in the kale. Cover and let simmer for several minutes. Once the kale has initially softened, add in the cooked mushrooms and the chickpeas, oregano, parsley. Add another 1/2 cup of vermouth and 1 cup of water and continue to cook. Place the turnips, with the cooking liquid, in a food processor and let cool. At this point, I rinsed out this pot, brought water to boil, and boiled the potatoes for 10 to 15 minutes to soften. Puree the turnip and cream, and add 1/4 tsp of sugar. Gently stir the puree into the stew, add the pepper flakes and a couple pinches worth of freshly ground black pepper, and add the potatoes when they are done. 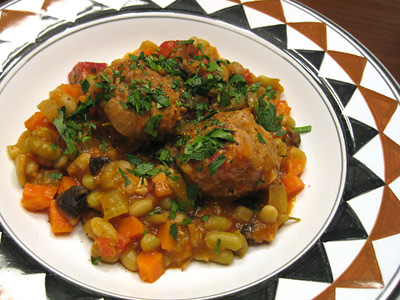 Cook the stew for a while longer on very low heat until you are happy the flavors have all come together. Add some water if it feels too thick. Taste for salt and pepper. 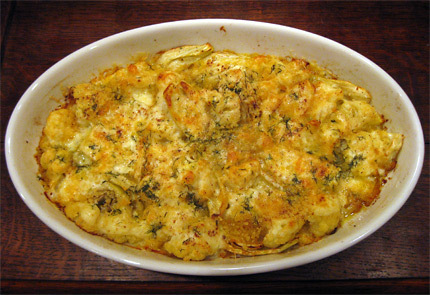 My predilection for comfort dishes means that gratins, bechamel and cheese are recurring themes, but before I begin, forgive me a small rant: there is a fine line between a dish that is richly delicious, and one that is so packed with cream and butter that you can barely eat a second bite. Too many restaurants err on the wrong side of that line. It reminds me of watching Anne Burrell explain, as she grabbed a huge handful of salt, how restaurant food is tasty because it is “better seasoned.” And I thought, “is that a euphamism for salty?” It is true that many tentative home cooks under-salt in the cooking process, but at least guests have a chance to rectify that. I find American Italian restaurants to be the worst offenders of over-salting. This isn’t just about health, although that is relevant to this topic, but just the observation that more is not always better. I understand a restaurant’s desire to exude luxury, but you shouldn’t need a red wine strong enough to punch you in the jaw to make it through more than a few bites of a dish. 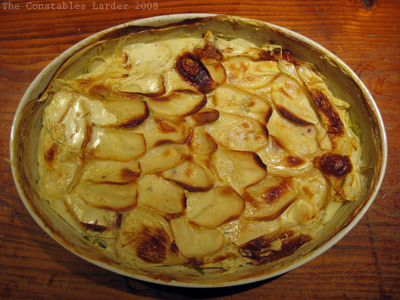 Now isn’t that a marvelously hypocritical way to introduce a dish with bechamel (one with more butter than flour even!) and cheese?! This dish is not something I would eat every night, but it was utterly delicious and while it went right smack up to the aforementioned line, it stayed just on the right side. On Saturday, we crawled through traffic back up the Eastern seaboard and returned from visiting family in Washington DC. There are few things more soul destroying than hours stuck traffic. Naturally, I needed to make a chicken pot pie to recuperate. 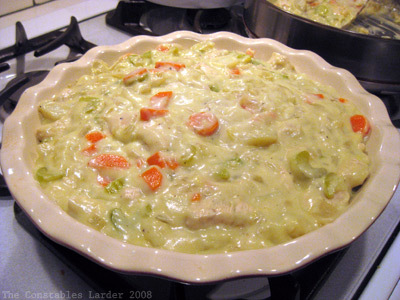 Chicken pot pie is scientifically proven to pack high levels of emotionally recuperative bosons and gluons by the ounce. It is a little known fact that they plan to test FermiLab’s Large Hadron Collider by accelerating a chicken pot pie to the speed of light and thus duplicating comfort food conditions at the origins of the universe. It will either cause the end of the world, or it won’t; there appears to be some debate, which is comforting in and of itself. 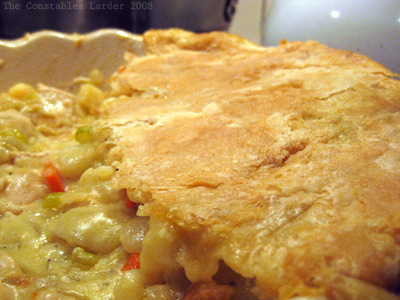 Below is a recipe for a simple pot pie, and a decent framework for elaborating upon with other ingredients (leeks, peas, turnips, parsnips) and herbs (parsley, rosemary, oregano, tarragon, etc). Note: I hope you’ll excuse the hack-job of the pastry edging in the above picture… I was moving fast in a race against the clock for Munchkin’s dinner time. For this pot pie, I decided to work off of Alice Waters’ savory pastry proportions from The Art of Simple Food. I was only making the pastry for the top, so reduced the amounts from the 2 cups of flour in her book, keeping with her proportions (hence the extra pinches of salt to get to around 1/3 tsp). Cut the butter into 1/4 inch cubes and place in the freezer for 15 minutes. Fill a glass with ice water and place next to your food processor. Combine the flour and salt in a food processor and pulse a few times to mix. Add the butter to the processor and add 4 tablespoons of the ice water, pulsing the mixture between each tablespoon. Remove the mixture to a clean surface and gently work it together. If it is not holding together at all, add another tbsp of the ice water. When the crumbly mixture is just holding together (you do not want it sticky or wet, and it is ok to have a little still crumbly), form into a rough ball, wrap in plastic wrap, flatten, and place in the fridge for an hour. Bring some lightly salted water to boil in a medium sauce pot and boil the potato until just tender, no more than 10 minutes given the small cut. Drain or remove to a bowl with a slotted spoon, and keep the sauce pot around for the white sauce. Heat a splash of olive oil in a large saute pan on medium heat and brown the chicken, then remove to the bowl with the potato. Lower the heat to medium-low and saute the onions and garlic for a couple of minutes, then add the carrots. 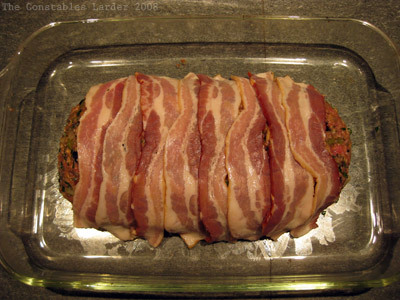 Cook for 5 minutes, then add the celery, ground savory (or other herbs), white wine, and a couple pinches of salt and pepper. Cook for another few minutes then turn off the heat. Stir the white sauce into the saute pan with the vegetables and taste for salt and pepper. Then stir in the chicken and potato. Spoon the mixure into your pie dish until it is near the edge. Photo note: the mixture looks a little green-ish because of the ground savory. Remove the wrapped pastry from the fridge, and on a lightly floured surface, with a floured rolling pin, roll out your pastry into a thin layer an inch or so bigger than you need for the pie dish. Lightly flour the top, to prevent it from sticking, and gently fold the pastry in half or in quarters to safely lift it in one piece to the top of the pie dish. Crimp the pastry around the edge of the pie dish, and then cut off any excess pastry hanging over the edge with a sharp paring knife. Make some vent holes in the top with the knife (or a fork). Place the pie in the oven (which was pre-heated to 375F) for 45 minutes, then let cool for 10 or 15 minutes before serving. What’s not to love about meatballs stewed in tomato sauce? It’s a timeless combination, no? 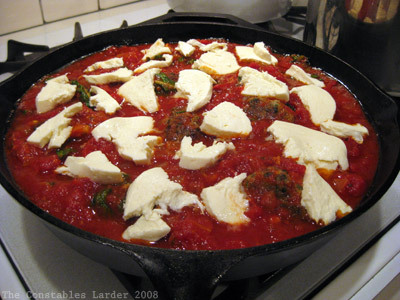 I love to cook variations of a recipe I originally picked up from Jamie Oliver (I’m a big fan of his cookbooks). 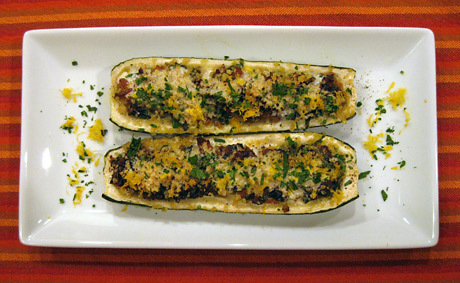 My original adaptation of the recipe is posted here. The other day, I remade it with some changes to the meatballs — there are so many directions you can go and still have it be delicious, as long as you don’t use spices that will conflict with your tomato sauce. The other major difference was the use of a big bunch of arugula instead of basil to add more body (I’m guessing that kale would be good as well). For this variation, I created a simple tomato sauce that combined 20 oz of peeled san marzano tomatoes with some sauted onions and garlic, ground savory, dried oregano, a splash of red wine vinegar, and seasoned with salt and pepper. 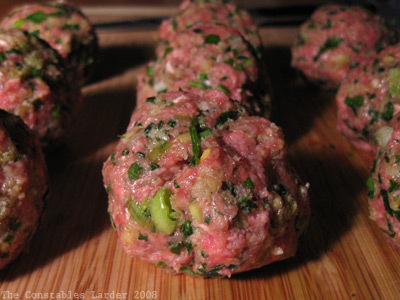 Combine everything and mold the mixture into meatballs. I made 9, each about an inch and a half in diameter. Then brown them in an oven-proof pan and then turn off the heat when browning is complete. Once the meatballs are ready to go and the tomato sauce meets your approval, turn off the heat to the tomato sauce and stir in a large bunch of torn arugula leaves (my guess is about 5 oz worth – considerably more than the amount of basil that went into the original recipe). 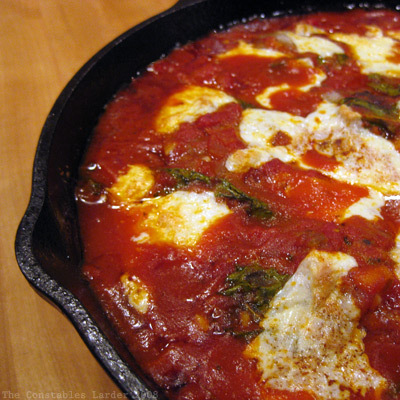 Pour the tomato sauce over the meatballs and add some chunks of mozarella cheese. 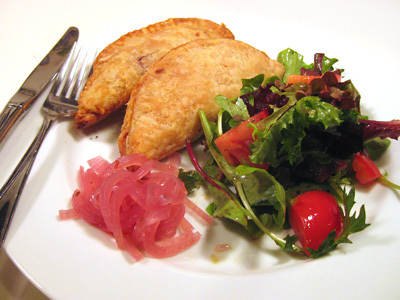 Place in an oven preheated to 400F and cook for 20 minutes.